Rani was taken from her family in India and enslaved when she was seven years old. After a year, her enslaver sold her into illegal adoption. She grew up in the United States. In 1992 she married Trong Hong, a survivor of trafficking in Vietnam, where he had been a child soldier. 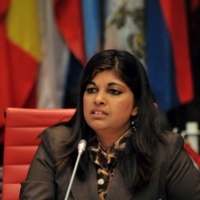 In 2002, Rani's testimony before the Washington State legislature helped to pass the state's first anti-trafficking legislation. Rani and Trong run the the Tronie Foundation, which supports survivors of human trafficking. 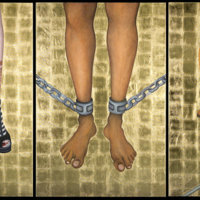 'House Slave - Field Slave: A Portrait of Contemporary Slavery' by Nicola Green was first exhibited at the Dulwich Picture Gallery in October 2007. It was then exhibited as part of Haringey's Black History Month at Bruce Castle Museum in October - December 2010. Nicola's triptych is now in the permanent collection at the International Slavery Museum in Liverpool. Nicola Green's portrait of contemporary slavery 'House Slave - Field Slave' was made for and in collaboration with Anti-Slavery International to commemorate the anniversary of the abolition of the slave trade in 2007. The exhibition consists of a large 'altarpiece' scale triptych with preparatory studies. These are set alongside artefacts of contemporary slavery from the International Slavery Museum in Liverpool and the extraordinary photos and text from Anti-Slavery International, which inspired this work. The painting tells the story of contemporary slavery. There are an estimated 12 million people in the world today who are still enslaved - even though the British slave trade was abolished 200 years ago. After several months in slavery, Beatrice Fernando reached the point of no return. Standing on a fourth-floor balcony in Beirut, Lebanon, she realized there was “no other way to get home” but to “dive backwards.” In a recent interview she explained of her decision to step off the balcony: “When we take a step against slavery, the world will take another step.”In 1980, at the age of 23, Beatrice had responded to an advertisement for work as a housemaid in Lebanon. She left her home country of Sri Lanka, intending to send money to her parents and her three-year-old son. But in Beirut she became a domestic slave. She was locked inside a home, starved, beaten, never paid, and forbidden from communicating with the outside world. Guards were instructed to shoot her if she tried to leave. After she reached a turning-point and escaped by jumping from the apartment’s fourth floor, she spent 21 days in a coma. Doctors told her that she was paralyzed. 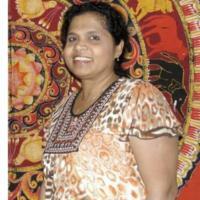 After 14 months in hospital she recovered from the paralysis and returned to Sri Lanka. In 1989 she came to live and work in the US.